Tonight: Increasing clouds. Lows in the upper 40s. Sunday: Mostly cloudy. A shower. Highs in the upper 50s. Monday: Mostly cloudy. Showers and a t’storm. Near record warmth with highs near 70. It felt a bit more like autumn today. In Boston, the temperature climbed to 75° on Friday with overnight low temperatures in the low 50s. Average high temperatures are typically in the 50s in early November. Temperatures on Saturday stayed in the low 50s. We will have another cool day on Sunday, but we will warm up once again by Monday. The record high temperature in Boston on Monday is 73°, which was set back in 2015. It’s possible we could tie that record. Showers and thunderstorms are possible, but if they hold off long enough, temperatures may climb into the mid 70s. It’s been a very warm autumn so far. 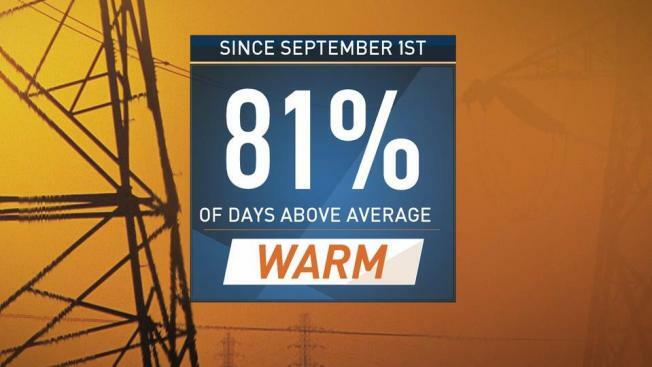 If you look at the days since September 1st, temperatures have been above average 81 percent of the time! October was the second warmest on record in Boston. If you combine September and October – they were the warmest in history. The average temperature was 64.2°. Cooler air will return by the end of the week. High temperatures on Friday could stay in the 30s for some areas. This too will be short lived. We are expecting another warm up after the three day cool down.